As we enter the last quarter of the year, and the 2011 ING NYC Marathon looms closer, I train for the marathon while working on completing races in order to qualify for the 2012 marathon. On my way to completing the requirements for entry into next year’s marathon, I ran the Staten Island Half Marathon. The New York Road Runners requires a member to run nine qualifying races and volunteer to help out with one over the course of a year to get an automatic bid into the following year’s marathon. 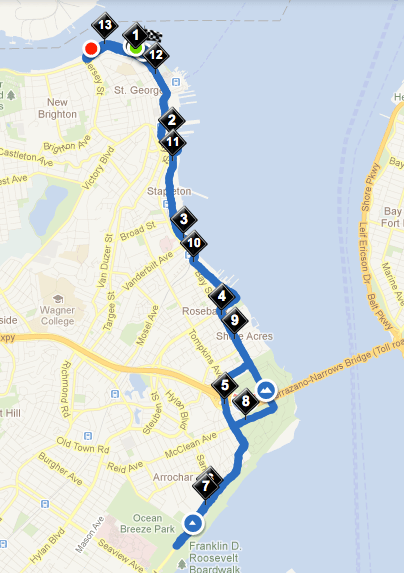 The Staten Island Half Marathon was my fifth race on the way to my bid for the 2012 ING NYC Marathon. Having recently ran the Disneyland Half Marathon with an average mile at 10:08, my goal was to bring that time down below 10 minutes per mile. The course was fairly mild around Staten Island, NY, with the exception of two hills, one of which was fairly long and was unexpected, since I hadn’t checked out the course prior to the race. According to my Nike+ GPS watch, I was keeping on pace to where I wanted to be, except during the hill. Once I crossed the finish line, my time was 2:11:00. Two hours and eleven minutes averaged out to 10 minutes per mile. Although I didn’t cross the line below 10 minutes, I consider it a success by dropping down 8 seconds per mile, and it means next time, I’ll do it and hopefully down to 2 hours to run 13.1 miles. 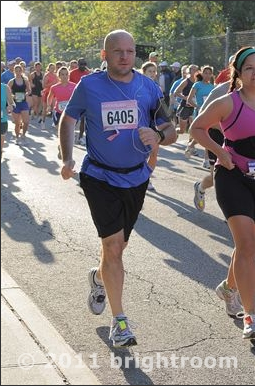 With my fifth race under my belt, I am focused on the 2011 ING Marathon, which is just mere weeks away. I look forward to running it as part of the American Cancer Society Determination team, and hope that you’ll support me as I run with them.